Polyploidy is a common observation in the genus Salix, including some of the shrub willow species currently being bred as a potential bioenergy feedstock. Breeding of shrub willow has produced new species hybrids, among which a disproportionate number of high-yielding genotypes are triploid, produced from crosses between diploid and tetraploid parents. These novel hybrids display significant variation in biomass compositional quality, including differences according to ploidy. The triploid and tetraploid genotypes possess lower lignin content than diploid genotypes. Biomass composition was also significantly different across the 3-year growth cycle typical of bioenergy plantings. There were differences in syringyl/guaiacyl (S:G) lignin ratios among the 75 genotypes examined, in addition to significant correlations with willow growth traits, yield, and composition. 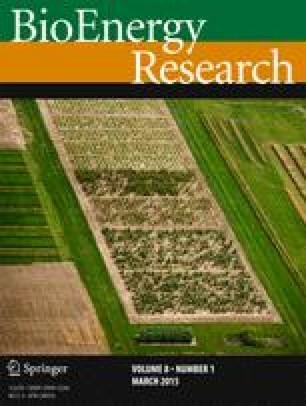 These differences suggest that a long-term strategy of breeding for triploid progeny will generate cultivars with improved growth traits and wood composition for conversion to biofuels. The online version of this article (doi: 10.1007/s12155-014-9521-x) contains supplementary material, which is available to authorized users. This work was funded by grants from the Northeast Sun Grant Initiative from the US Department of Transportation and the US Department of Agriculture. The authors would like to thank Kayla Relyea, Michelle Von Loessl, Berdine Coetzee, and Rebecca Chase for their assistance on this project. Steve Gordner and Matt Christiansen provided expert assistance with field trial establishment, maintenance, and harvesting. Additional technical support was provided by Kimberly Cameron, Michael Rosato, Kayleigh Hogan, Jane Petzoldt, Cody Lafler, and James Ballerstein.